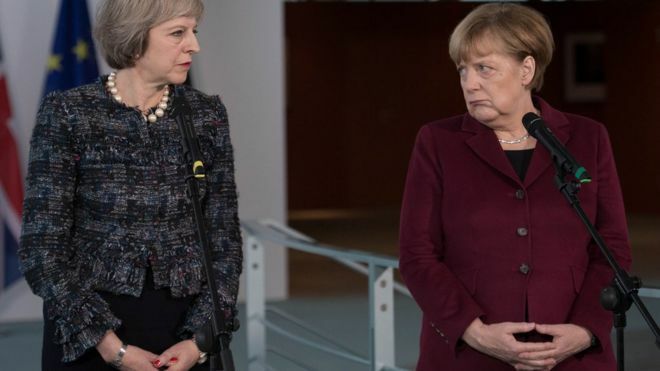 Theresa May attended a meeting with Angela Merkel yesterday and was taken aback when stone-faced Merkel let her true emotions slip out. Merkel is currently struggling to cobble together a coalition to run Germany after being savaged at the recent elections primarily due to her decision to permit millions of undocumented "refugees" into Germany. Merkel said bombastically “We basically have not changed our stance on Britain leaving the European Union...In fact, we deplore it.” It was an interesting term to use considering the way Hillary Clinton referred to Trump Supporters as "Deplorables" which many commentators have since seen as a galvanising moment for them to unite and campaign against Clinton. Merkel's decision to allow millions of "refugees" into Germany has been seen as one of the most significant miscalculations in modern German political history with a massive surge in terror attacks, attacks on women and other barbaric practices not usually seen in Europe. Commentators have said that rather than Merkel winning support in the UK with these comments, she will like Clinton, make people even more determined to fulfill a full and clean exit from the European Union. Do you agree we need out the EU fully? Read: "No jobs for British Workers!" Read: "CULTURE CLASH: Migrant skin and chop-up dog for barbecue "